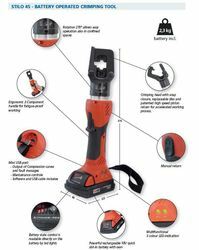 We are a leading Exporter of modular insulated tools, hand hydraulic cable cutting tools, intercable insulated hand tools, battery operated crimping tool, cable cutting and crimping tools and cutting tools for industrial work from Mumbai, India. We are the manufacturers of the complete range of Modular Insulated Tools, suitable for all sorts of electrical applications. These are portable in nature. The Modular Insulated Tools are very user friendly, light weighted and comfortable to use. These tools are manufactured using high quality raw materials and are followed by certain quality checks to provide satisfaction to the clients. These tools are mainly used by the electrical departments. Mainly used for cutting armoured copper and aluminium cable, the Hand Hydraulic Cable Cutting Tools are very user friendly. The hook is easy to release and has an automatic pressure release feature. The cutting head rotates a complete three sixty degree. The blade can be retrieved easily any time during operation. Manufactured using high quality raw materials, the cable cutting tool, is highly demanded in the market. Certain quality check procedures ensure the premium quality we provide. 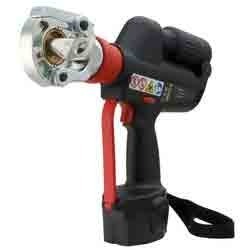 We are the manufacturers and exporters of high quality Intercable Insulated Hand Tools. These products are manufactured using high quality raw materials and are even sent for certain number of quality checks. Being one of the market leaders we do not compromise with the quality of our products. These tools are very light weighted and portable in nature. These are insulated and are available in a wide range. These products are available at a very affordable price. The Battery Operated Crimping Tool is a fully automatic crimping tool that provides accurate sealing. These tools in case of any malfunction indicate through a LED and sound alarm. 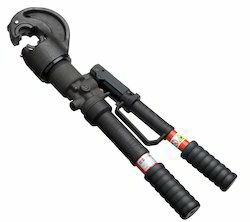 With a comfortable design and a good balance it can be operated using one hand. These tools have a power saver feature that automatically a stop all functions the moment operation cycle is completed. To provide the customers optimum satisfaction these products are manufactured using high quality raw materials. Intercable Ramscheid Cable Cutting and Crimping Tools. 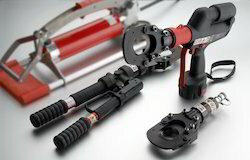 Master Catalogue for Cable Cutters, Crimping Tools, Dies, and Hydraulic Power Units. 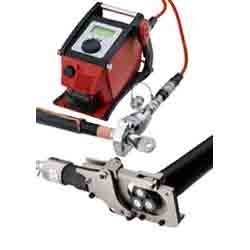 Ideal for Manual, Hand Hydraulic, Battery Operated and Hydraulic Power Units for Electrical Crimping and Cutting of cables. Intercable located in Bolazo, and Ramscheid Germany is fast becoming a European Market leader. Please down load the 2013-2014 Catalogue for More Infoirmation and Selections. We being one of the leading producers of Copper Transpose Cutters, produce them using high quality raw materials and provide them at a very reasonable price. These cutters are further sent for a series of quality checks to provide the client utmost satisfaction. We provide a wide range of cutters to meet the needs of the industry. These products are highly suitable for transformer makers and electrical contractors. This instrument increases the cutting speed during the process without causing any wastage. Universal Cable Stripper is produced using high quality raw materials and they go through a number of quality checks to provide the customers with optimum satisfaction. 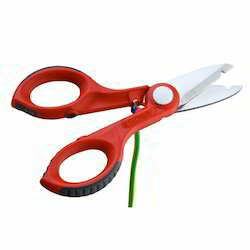 These cable strippers are shaped perfectly and are portable in nature. These are designed such that they do not damage the shelled wire. The mouth of the press pliers is made of magnetic steel. 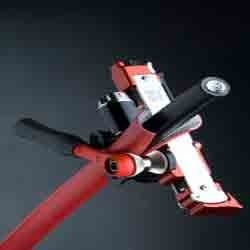 This Universal Cable Stripper is highly durable and efficient in nature. We provide these in the market at a highly affordable price. High quality Hydraulic Compression and Cutting Tools are manufactured and exported by us. 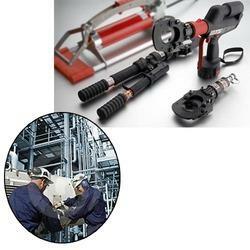 These tools can be used for all sorts of crimping and cable cutting purposes. These are battery operated and are highly efficient in nature. These tools are light weighted, portable and highly durable. Living up to our market reputation, we produce these tools using high quality raw materials, and process them through various quality checks. Highly demanded in the market, we provide these products at a reasonable price. The Hydraulic Pump we provide is highly efficient and reliable. 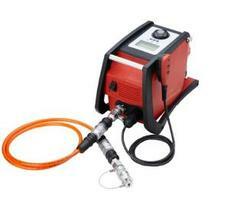 These pumps are highly compact with a very high power density. These pumps are environment friendly as they absorb the excess oil and produce a very low level of noise. These Hydraulic Pumps are easy to maintain and have a long life. These are highly user friendly as they are easy to use and program. The light weight of the pump makes it portable. High quality raw materials and latest technologies are used for manufacturing this Hydraulic Pump. 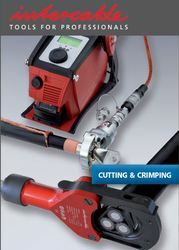 Looking for Electrical Cable Crimping & Cutting Tools ?